Edward Hallstrom, as we know from the story of the Zoo Feeder IPA, was a philanthropist of note. But giving requires a fortune first and Hallstrom got his by inventing a fridge called Silent Knight. Evidently the unit was cheap to buy so became very popular - thus the fortune - but was so astronomically expensive to run that Hallstrom actually came to an agreement with electricity suppliers to subsidise his customers’ running costs. Still, it’s an Aussie-made success story and having a beer named in its honour seems appropriate. Perhaps Silent Knight the fridge would even be the perfect one for Silent Knight the beer, keeping it cold until you can’t afford to any more. And that’s when you’d crack this porter open, just as a little warmth creeps in and the flavours start to open up; smooth chocolate and rich roast from nine different malts. The beer has been designed as a lighter version of a Russian Imperial Stout, so it’s got plenty of character without the potent kick and instead finishes quite dry. 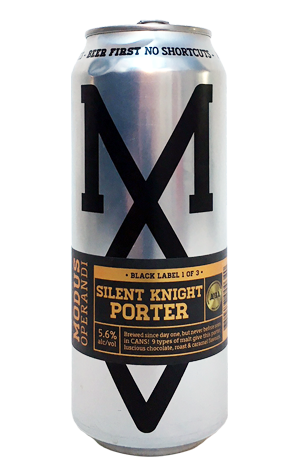 With the brewery’s many and varied hoppy beers tending to hog a lot of the headlines, Silent Knight does feel like it gets a little forgotten. Not by judges though – this is a perennial gold medal winner at competitions across the land. And not by the brewery, where it was elevated to limited edition "Black Label" can status for winter 2018.